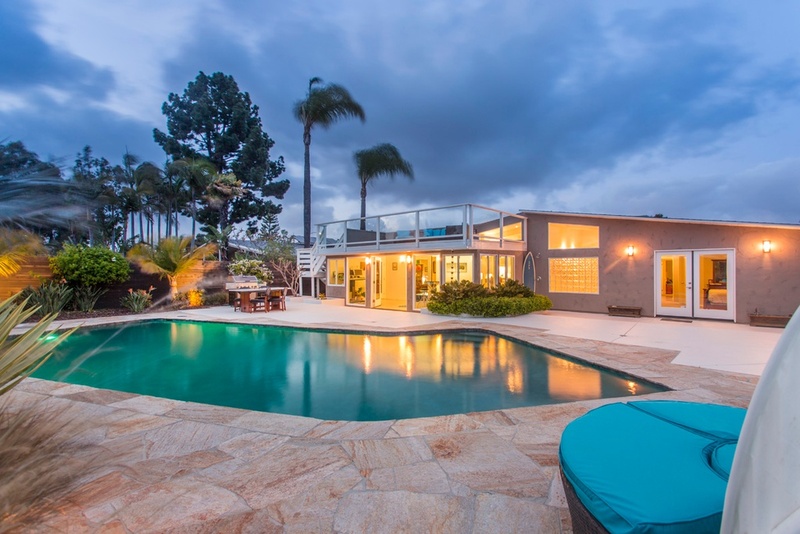 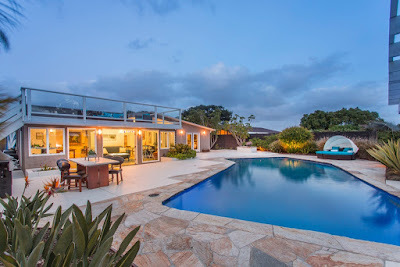 Built in 1962 by the Drogin Construction Company is this Palmer & Krisel-designed home in La Jolla Crest, San Diego, CA. 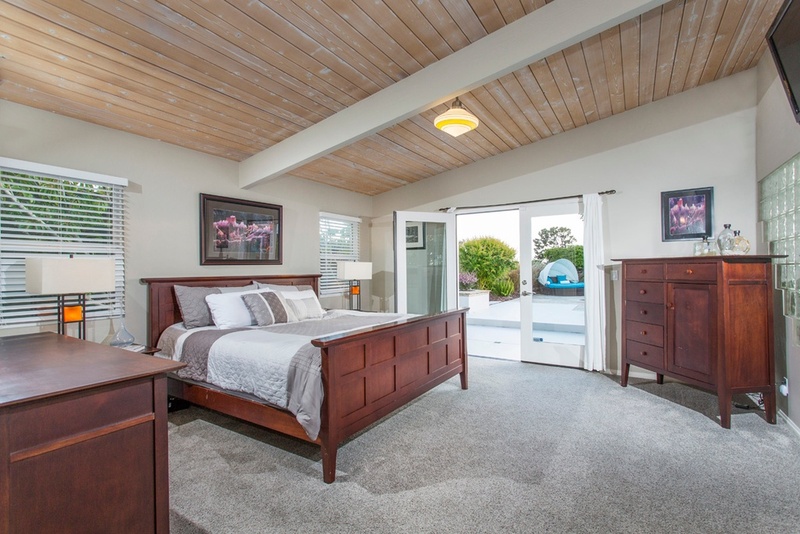 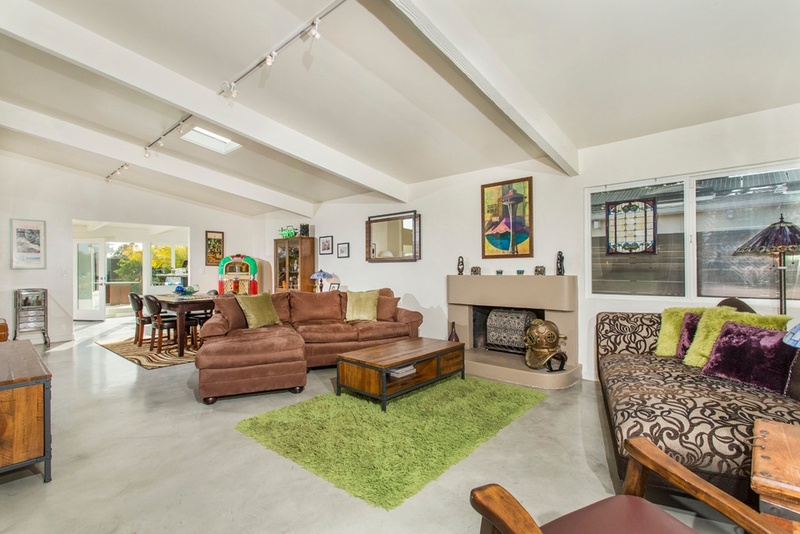 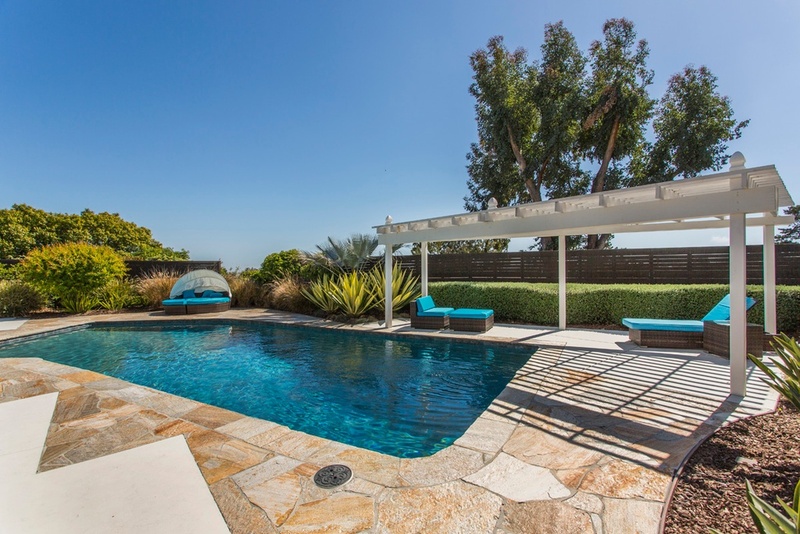 This expanded home includes three bedrooms and two bathrooms in 2,300 square feet, sits on a 10,000 square-foot lot with an in-ground pool and includes a large roof deck with Mission Bay views and carries an asking price of $1,450,000. 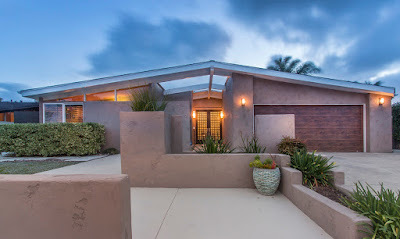 The front of the home still retains its original midcentury lines and proportions, but has been resurfaced with a smooth plaster-like finish. 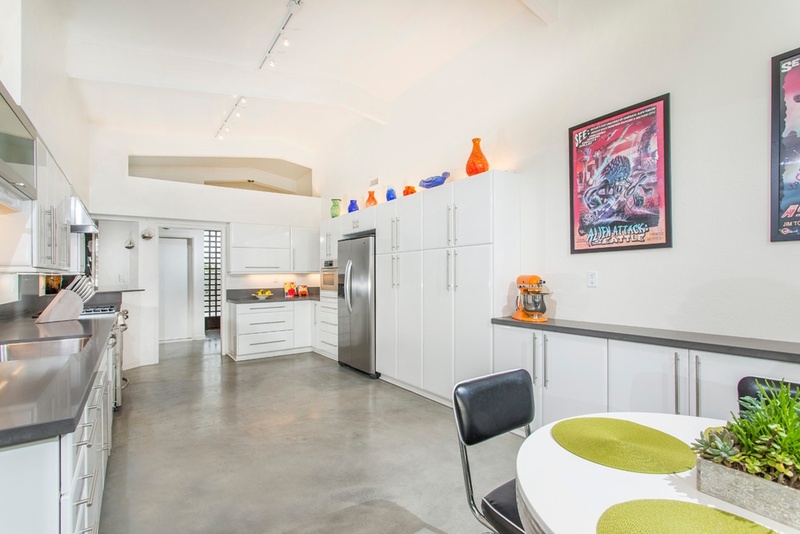 Entry is gained through a recessed central courtyard with double doors. Raised planters filled with well-kept plantings separate the front yard from the adjacent roadway, and conceal a small patch of turf. Inside, the living and dining rooms sit along the north side of the home, the kitchen lies at the center, and the bedrooms are sited along the south side of the home. The entry leads into the linear living room, which opens to the adjacent dining area. 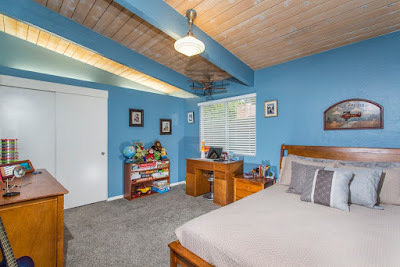 The original vaulted ceilings are in place, with drywall covering the original wood in the living rooms areas, and original exposed wood in the bedrooms. 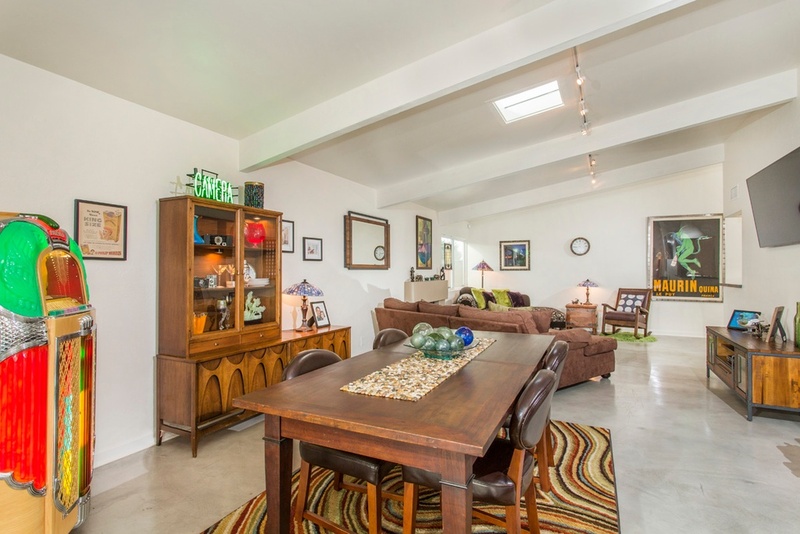 Clean concrete floors line the home, giving it a light, contemporary feel. 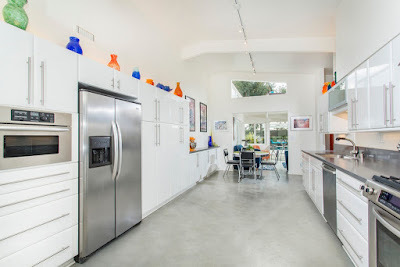 The kitchen sits long and linear at the center of the home, with clean, updated white cabinetry, grey composite counters and stainless steel appliances. A small breakfast nook sits towards the rear of the kitchen, and an open is provided to the adjacent family room addition at the rear of the home. 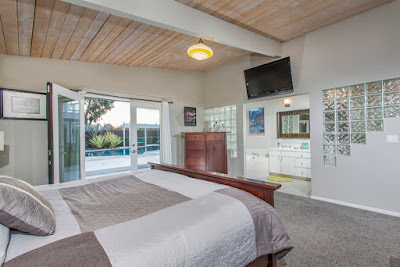 The master bedroom sits at the rear corner of the house, and provides French doors leading out the backyard of the home. 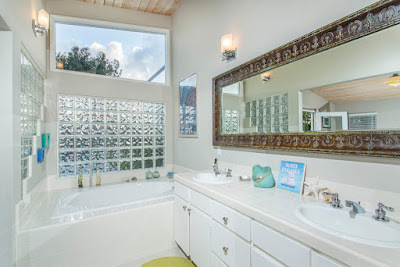 The master bathroom has been opened to the bedroom, and features a traditional renovation, with white tiled countertops, a large oval soaking tub and lots of glass block. 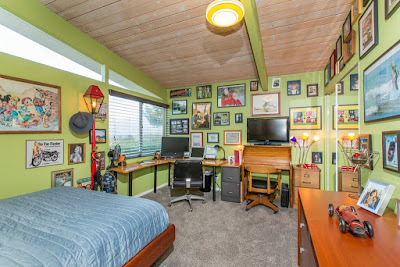 The remaining two bedrooms sit adjacent to the master, both in their original configurations. The backyard features a large in-ground pool at the center of the yard, surrounded by ample patio space and lush, mature plantings giving the space resort-like feel. 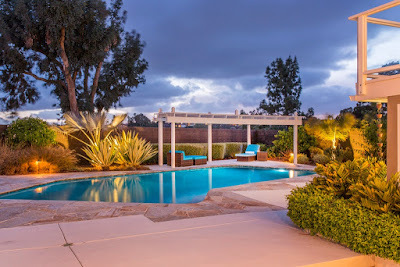 A white pergola sits across the pool, set amid well sculpted shrubbery and a privacy fence. 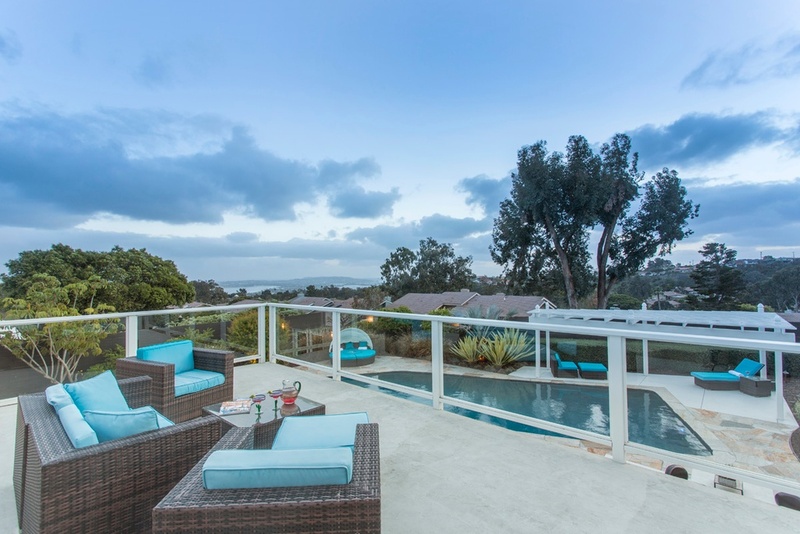 A sundeck sits above the family room addition at the rear of the home, providing Mission Bay and city light views. 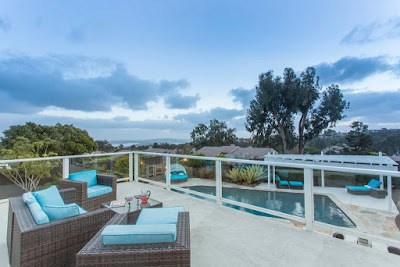 For a slice of midcentury modern mixed with Mission Bay views, be sure to check this property out.